WHEN 15,000 female garment workers went on strike in New York City more than a century ago, their goal was to secure higher wages, shorter hours and better working conditions. Women today are still pursuing those aims. Although working conditions have improved significantly since the protest in 1908, which led to the creation of International Women’s Day (now celebrated on March 8th), the median pay gap for full-time working women is still around 14%. And figures from The Economist’s latest glass-ceiling index, which measures where women have the best chance of equal treatment at work, show that, after decades of improvement, progress for women in the workplace has stalled in recent years. Many of the measures associated with equal treatment at work, including pay, seniority and the decision to enter the workforce at all, remain relatively stable. Our index is based on performance across ten indicators including educational attainment, labour-market attachment, pay and representation in senior jobs. 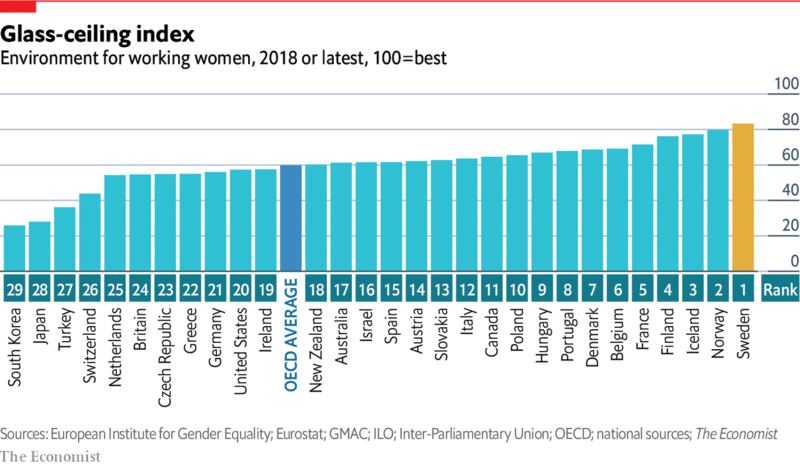 In the OECD, a club of mostly rich countries, the gender pay gap, which measures the difference between what a typical woman and man earn, remains largely unchanged from last year at around 14%. The share of women on company boards, at 23%, has slightly increased, but the proportion of women in management has barely budged. Although the share of women in the labour force has crept up a little, to 64%, it is still 16 percentage points below the male average. With few changes in the underlying data, it is little wonder that the countries doing best in this year’s glass-ceiling index are mostly the same ones that received top marks in previous years. The Nordics are particularly good at getting women to complete university (around half earn a degree) and secure a job (some 75% are in the labour force). They also have a large share of women in senior positions; in Sweden and Norway the figure is around 40%. Mandatory quotas for women on boards have helped boost female representation. The Nordics also offer better parental-leave systems. Flexible schedules help parents who want to juggle work and child care. More than half the employees in those countries have at least some control over their working hours. The OECD countries with the worst environment for working women tend to be in Asia. In South Korea, which ranks last in our index, the pay gap is a whopping 35%. The female labour-force participation rate there is just 59%, compared with 79% for men. Moon Jae-in, South Korea’s president, would like women to hold 10% of senior government positions and make up 20% of public-company executives and 40% of government committees by 2022. But there is a long way to go. Boards of directors at publicly traded South Korean firms are 98% male; out of 109 companies, only one has a female boss. Just over one in ten managerial positions in the country are held by women. While paternity leave is generous, uptake is still low. Cultural and societal norms appear to be a decisive influence on gender equality at work. In Asia, many women are expected to choose between having a family and a career. Moreover, the division of labour at home is often woefully unbalanced. In Japan and South Korea, for example, women do roughly five times more housework, food shopping and other unpaid activities than men do. Women who want to climb the career ladder often struggle to secure spots at top firms. Men are typically favoured for promotions. Still, there have been some bright spots, particularly in the governments of western democracies. Last June Spain’s prime minister appointed the first female-majority cabinet since the country returned to democracy in 1975. Last November more women than ever were elected to office in America’s mid-term congressional elections. And despite threats to their leadership, Angela Merkel and Theresa May still hold the top political positions in their respective countries. Having women in positions of power should improve the chances of public policies that promote equality in the workplace.